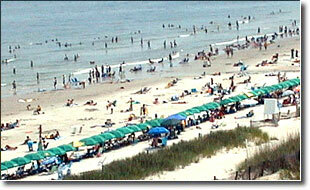 The Myrtle Beach Resort is one of the most popular full amenity oceanfront vacation destinations on the beach. This oceanfront paradise is located in the heart of the world famous Grand Strand, a glitzy 60 mile stretch of white sandy beaches winding along South Carolina's coastline. 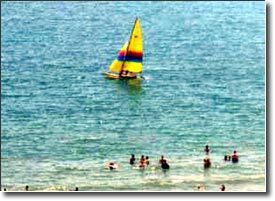 It is a place where vacationers, young and old, seek the fun and thrills offered by the bright lights and non-stop entertainment of Myrtle Beach. 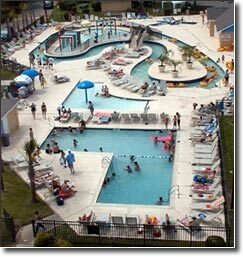 The Myrtle Beach Resort is at the heart of this mega entertainment center. This self-contained 33 acre oceanfront resort features 750 feet of sandy white beach on the beautiful Atlantic Ocean. The Resort has a wireless Internet connection, a waterpark with a 375 foot heated Lazy River, bucket dump, mushroom shower, kiddy pool and a large, 4-section hot tub. There are 6 swimming pools, including 2 indoor heated pools, 4 whirlpools, 2 steam rooms, saunas, children's playground, 4 lighted tennis courts, basketball court, volley ball, lighted shuffleboard, bocce ball, barbeque areas, oceanfront cabana bar (with live entertainment in season), poolside snack bar, deli/cafe, convenience store, game room, gift shop, and an enclosed indoor atrium. You will find hundreds of restaurants to meet every budget and palate. It is especially a seafood lovers paradise. The Resort is within minutes of 4 major malls, night clubs, music theaters, thousands of specialty shops, flea markets, amusement parks, 2 piers, shipwreck diving, botanical gardens, a zoo/wildlife park, and a variety of other family-orientated entertainment facilities. 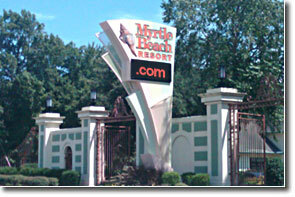 The Myrtle Beach Resort is in the heart of a golfers wonderland with over 100 area golf courses. 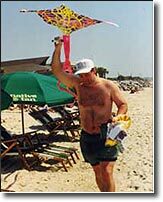 Myrtle Beach is known as the Golf Capital of the World. It is here that you can find some of the highest quality golf courses in the nation. Golf Digest Magazine has named 10 of the beach's courses to the "Top 100 Public Courses in America." Not only that, but 36 of the areas courses hold a rank of four and one half stars or higher.